An arm lift, or brachioplasty, is a surgical procedure designed to remove loose skin and excess fat in the upper arms. Women in their 30’s to 50’s with loose, flabby upper arms. 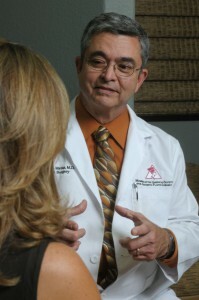 At your initial consultation, plastic surgeon James Matas, MD will discuss your goals and motivations for surgery, along with assessing your physical and emotional health and reviewing information you provide about previous surgeries, past and current medical conditions, as well as nutritional supplements, herbal remedies and pharmaceutical medications you take. He may require you to take certain steps before surgery, including guidelines on eating, drinking, smoking and taking certain medications and vitamins. He will examine your upper arms, assessing the amount of fat and loose skin you have. He will explain factors that may affect outcome, along with the risks and benefits of the procedure. The procedure can be performed with liposuction alone, surgical excision of excess skin and fat or a combination of the two performed together. During your consultation, Dr. Matas will advise you of the best technique for your circumstances. If only liposuction is needed, small incisions less than ½” are placed near the inside of the elbow and upper arm. A small surgical instrument known as a cannula is inserted into the arm, and Dr. Matas moves the cannula back and forth through the fat that is suctioned through a gentle vacuuming process. A special type of liposuction, known as ultrasonic-assisted, liquefies fat prior to suctioning and is superior for upper arm reduction. When skin tone is loose and greater amounts of fatty tissue need to be removed, surgical excision is needed. First, an incision is made beginning on the inside of the elbow and continuing into the armpit area. Depending upon the contour desired, a long wedge of excess skin and attached fat are surgically removed, allowing the two edges of skin to be brought together and tightened. A drainage tube is inserted under the skin to remove excess fluid, and will be removed several days later. The incisions are then closed with sutures and the upper arm is wrapped to provide gentle compression. The procedure takes about 2 – 4 hours and is performed outpatient under general anesthesia. During the first week, you may experience mild pain, bruising, swelling and tightness in your upper arms. Any discomfort can be controlled with prescribed medication and by applying cold compresses. You may return to light duty within 5 to 7 days, but physical upper body exercise should be avoided for 2 to 3 weeks. 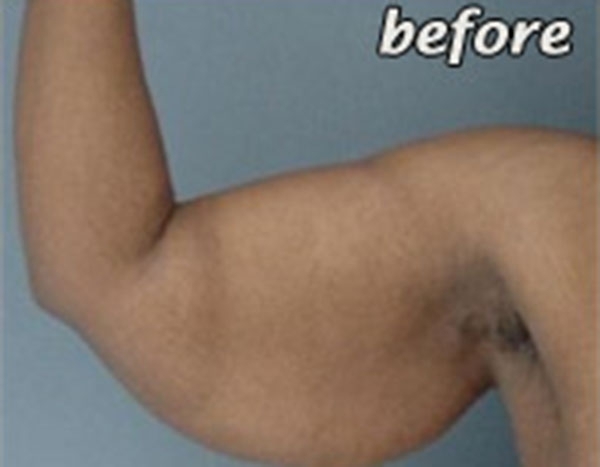 Over the next few weeks, the swelling will resolve and you will begin to see smaller, firmer arms. After the initial recovery and to further your results, Dr. Matas may recommend weight training to further define your biceps and triceps muscles. Although the incisions are permanent, they will fade over the first several months to become less visible. It is important that you apply sunscreen to the incisions during the first year to avoid darkening. Although others may not notice, you will have more confidence in the appearance of your arms when they are smaller and firmer. You may feel comfortable wearing a wider variety of clothing…even short sleeves, tank tops and bathing suits.